The Free Dictionary is one of just a handful of apps to be included in the launch of app indexing for iOS. iPhone and iPad users can now open The Free Dictionary app directly from Google results when logged in to the Google app or Chrome. Farlex: This free online dictionary challenges its users to define two words; approved definitions provide a school meal for a child in need. The Free Dictionary partners with Google to offer App Indexing for Google Search. Android users can now open Google Search results with The Free Dictionary app. Free Dictionary Releases Google Glass App. Steve Boymel presented at Critical Thinking University Achievement Awards. Whether you want a simple definition or an entertaining game, TheFreeDictionary from Farlex combines an extreme amount of information and tools within one simple app. Keynote Speaker: Steve Boymel, Farlex, Inc.
2011 About Web Search Readers' Choice Awards - Best Reference Site! The race for the title of Best Reference Site was a close one, with two sites in particular taking the lead and running neck and neck almost the entire voting period. 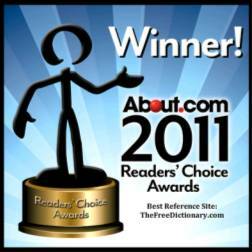 However, there can only be one winner, and readers chose TheFreeDictionary.com, a useful Web site that collates all sorts of useful reference content into one convenient place. The Free Dictionary by Farlex, is a wonderful web resource to add to your growing web collection. Farlex to Present at InfoCommerce 2008. Has your website had over 1 billion visitors? If not, you'll want to listen to and speak with Steve Boymel of Farlex.com at InfoCommerce 2008. They'll all be speaking at InfoCommerce 2008, and that's just the Day One line-up! Librarian Chick's Smart Site of the Week. The Free Library - A free, searchable archive that provides access to a daily-updated collection of 4 million articles from classic works of literature and leading periodicals. Included in the IPSAportal project, featuring the best 300 websites for online research in Political Science (http://www.ipsaportal.net/). Managed by an International Editorial Board and updated on a regular basis, IPSAportal is an official publication of the International Political Science Association launched at the 20th IPSA World Congress (Fukuoka, Japan, July 2006). Don't have or can't afford a book and can't get to the library? Try ... thefreelibrary.com. The easiest way I could figure to scare up a copy was on www.thefreedictionary.com. "The Free Dictionary by Farlex, with separate searches in computing dictionary, medical dictionary, legal dictionary, financial dictionary, acronyms, idioms, Columbia Encyclopaedia and Wikipaedia Encyclopaedia, is also a popular online search engine." "TheFreeDictionary.com ... serves up a wealth of reference material. ...there's no question this is an invaluable tool for students, researchers and other answer-seeking users." "It is hands down the best free dictionary online today." Cool site of the Day! - Create your own home page. What's the first thing you like to see when you open your Web browser? Personally, I "want quick access to information... Nifty!" "You'll want to bookmark this site (and maybe make it your home page) for the next time you need to know something!" 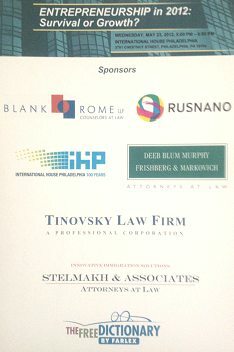 2006 WebAward Competition: The Free Dictionary received an Education Standard of Excellence award from the Web Marketing Association. PC Magazine listed The Free Dictionary in their list of sites that are flying under the radar, but are useful, funny, or interesting enough to merit entrée into the Web's public consciousness. NETLINES, Harry Brown, BMJ, July 8, 2006; 333: 102. Looking to expand your vocabulary, want a new quotation every day, or need a dictionary reference source? www.thefreedictionary.com may well be the answer to your quest. This collection of excellent resources includes a medical dictionary, a legal dictionary, and help with acronyms. If you want to expand your horizons further, there is an article of the day, as well as hangman and a word quiz. The dictionary set up alone is worth a place in your favourites file, but there is much more than that here. This is a fun, educational site. "... a really smooth Google-like personalized home page with smooth drag and drop, easy RSS adding (including the number of posts to show from a favorite blog), and color customization. Pretty nice." The Free Dictionary was reviewed and selected an Official Honoree. It is a tremendous honor to be selected as an Honoree as less than 20% of all sites entered receive this mark of distinction. With over 5,500 sites entered this year, this truly is a noteworthy achievement. There also are Web sites that aggregate reference works including dictionaries and encyclopedias under one online roof. Two of the best are thefreedictionary.com and bartleby.com. TheFreeDictionary.com is like the Swiss Army knife of reference sites, offering free English, medical, legal, financial and computer dictionaries, a thesaurus, encyclopedia, literature reference library and search engine rolled into one. 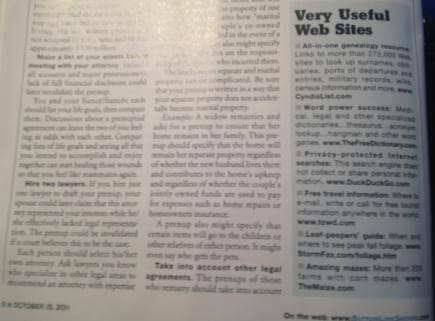 The Feb 2006 issue of the Journal of Accountancy mentions TheFreeDictionary.com in the column Smart Stops on the Web (page 31). This Smart Stop works overtime not only to define a word, but also to give users antonyms, synonyms and two online encyclopedia results. A query of accounting returned five listings for the word itself plus links to other definitions associated with it, such as accrual basis and internal control, references in classic literature and links to related Web sites. This site's home page also gives users a quotation and word of the day, as well as a word game to enhance vocabulary. The Free Dictionary includes nine dictionaries, including medical, computing, legal, and financial, as well as idioms and acronyms (it found BFD, so it's okay in my book). The Free Dictionary at www.thefreedictionary.com offers more than the yellowed pocket dictionary you lugged to school every day. It starts with a vibrant assortment of quotations, topical news items and articles. I particularly enjoy the "This day in history" section, and wish I'd had access to this sort of site when I was at school. The editors of District Administration magazine for K-12 school administrators selected The Free Dictionary Web site as "Dr.Hotlist Site of the Week"
"TheFreeDictionary.com is a one-stop Internet reference desk ". to make word-hunting easier." "TheFreeDictionary.com .... starts out with interesting shorts on its home page: this day in history, word of the day, quotation of the day, article of the day, etc. Moving on, it provides links to specialized dictionaries in business, science, medical, legal, etc." "...TheFreeDictionary.com has developed a reputation as a multifaceted, virtual research hub for students and teachers." Steve Boymel appeared on "A Balanced Breakfast," an early morning radio show. Steve Boymel appeared on "KRLD's Sunday Staff Meeting," an early morning radio show. "...this Web site offers an online dictionary, thesaurus and encyclopedia. Type in a word (penurious) and presto, you have the definitions (1. stingy, 2. barren, 3. destitute) as well as synonyms, antonyms and examples of the word used in classic literature." 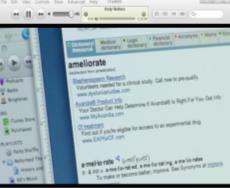 "www.TheFreeDictionary.com has quickly grown to become one of the best reference sources on the Web." "I want it all. Fortunately, when it comes to the English language, The Free Dictionary has it. And that's a certain sort of heaven for logophiles, because this site brings together a cluster of resources to help you better understand what each word means…There are other fun bits of trivia, too: a word of the day, birthday of the day, article of the day and word game." "Each time visitors to TheFreeDictionary.com search a word or term, they find an incredible array of information that paints a rich, complete picture of the entry in question. In addition to the expected definitions, audio/phonetic pronunciation guides and etymology, TheFreeDictionary.com offers synonyms, antonyms and related words from its thesaurus, as well as usage examples from classic literature." Steve Boymel of thefreedictionary.com was interviewed live for the "Computer America" by Craig Crossman. "Recently, I discovered another site to add to my favorites list when I received a press release about TheFreeDictionary.com. Whether you're a student or just an avid learner, I'd recommend checking it out." "Stumped by a word? Check out TheFreeDictionary.com, which provides definitions, audio/phonetic pronunciation guides and etymology. In addition, the advertiser-supported site offers synonyms, antonyms and related words as well as examples of how the word is used in classic literature." "Adults and children from the United States, Europe, India, Japan and other locations across the globe have made the site one of the best and most widely used reference sources on the Internet. It has become a necessity for professionals, students and the general public"
"TheFreeDictionary.com is more and more handy in particular because you can search other type of dictionaries, the thesaurus, and best yet, wikipedia." Included in the Web Watch column. "The Free Dictionary provides more than word definitions. Search results include antonyms, synonyms and related words, as well. In addition, the site's database includes audio files so you can hear the correct pronunciation of your search term. Also, Free Dictionary gives examples of the word being used in classical literature, putting its use in context." "Want a fun, quick way to combat summertime brain drain and sprinkle some k-n-o-w-l-e-d-g-e into your high schooler's head? Simply have them look up the definition of a word at www.TheFreeDictionary.com. The site is an all-inclusive resource for definitions, synonyms, acronyms and lots of random facts and trivia including quotes, history tidbits and biographies of famous folks"
"TheFreeDictionary.com spits out results culled from a dictionary, encyclopedia and thesaurus on the same page." "Visitors get one-click human voice pronunciation and subdefinitions that pop up as the mouse hovers over text in the entry"
"If you're looking for quick information on just about any topic, this site which combines English, legal, medical, financial and computer dictionaries -- not to mention an online encyclopedia, thesaurus and other references -- on an easily searchable Web page." Included in the article titled Make Your Browser Better. 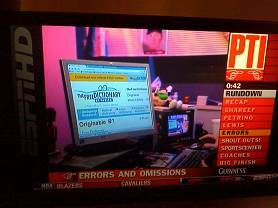 Colleen O'Doherty utilizes thefreedictionary.com in her article titled UNO College Democrats and MoveOn protest elimination of filibuster. "satisfy your curiosity and plug it into the search engine at The Free Dictionary. The Free Dictionary provides more than word definitions. Search results include antonyms, synonyms and related words, as well. In addition, the site’s database includes audio files so you can hear the correct pronunciation of your search term"
"This site deserves a bookmark - www.TheFreeDictionary.com." "It's more than a dictionary. Try TheFreeDictionary.com, which offers definitions, pictures, related words, synonyms, antonyms, an example of classic literature using the word in context and audio pronunciation." TheFreeDictionary.com was included in their "Reference Shelf" for journalists. Internet Spotlight column highlights thefreedictionary.com as a great reference site. The Hurricane recommends thefreedictionary.com as a great resource for homework, papers, and projects. Tech columnist Stan Miller included TheFreeDictionary.com in his Blog.